We are VicHoney, the online presence of Upper Beaconsfield Apiaries. We are a family-run boutique bee and organic honey apiary based 50km south east of Melbourne in the foothills of The Dandenongs. 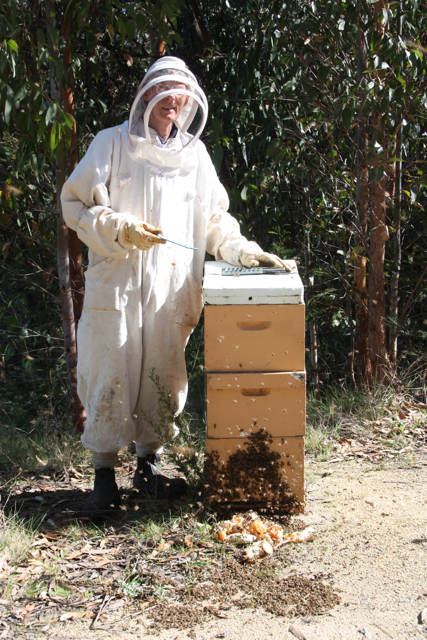 Our aim is to produce the highest quality Australian eucalyptus organic honey through our own well managed beehives. Our organic honey is cold-extracted and is NOT blended with imported honey or with different honeys to alter its colour or taste. Our honey is purely what our bees produce during the seasonal flowering of the native Australian eucalyptus trees. For further information about our organic honey, please visit the organic honey page – alternatively, we highly recommend you sample some of our organic honey by taking a look at the range of purchasing options in our Online Organic Honey Shop . We provide a fee-based live bee swarm removal service during the warmer months of the year. For more information, for example if you have discovered a swarm of bees on a property in Victoria, Australia, that you’d like removing, please visit the Swarm Removal page. Our beehives are available for hire for pollination of fruit trees and crops. Please visit the Pollination page to find out more about this useful service. From Spring onwards, we will have bees for sale for beginners and established beekeepers to add to their own boxes. We are passionate about bees and believe it is vital to maintain healthy beehives, as you would for any other livestock. We believe that Australian eucalyptus honey is superior honey and celebrate the unique flavours obtained from different eucalypt trees. We would like you, the consumer, to know more about the honey you eat and to be aware that honey is healthiest when not finely filtered (all pollens removed) or heated to obtain and keep a runny consistency. Organic honey is best in its purest form.